WASHINGTON, D.C. – (RealEstateRama) — Americans can now preview what’s in store for coastal communities, and the fish many depend on, as offshore wind development builds steam in the U.S. The American Wind Energy Association (AWEA) and the Special Initiative on Offshore Wind (SIOW), based at the University of Delaware, released a new video today that features never-before-seen underwater footage of fish feeding at America’s first offshore wind farm, as well as testimonials from local recreational fishermen and charter captains. Offshore wind is scaling up in the U.S., with the federal government and states including Massachusetts, Rhode Island, New York, New Jersey, and Connecticut all taking significant actions recently to boost demand for this new ocean energy resource. America’s first offshore project, the Block Island Wind Farm, was completed just over a year ago, in late 2016. Since then the sector has only grown hotter. Block Island residents, including fishermen, have been pleased with the results a year after the wind farm came online. Electricity rates are down, tourism is up, and the island has access to high speed internet for the first time because of the project. One of those residents, Chris Hobe, is captain and owner at Fish the World Charters, a small business that has seen new opportunities taking tourists to see the turbines up close. A recent study from Europe, where hundreds of offshore wind turbines are already installed, found that a single turbine can support up to four metric tons of shellfish, which in turn attracts fish to the area. For up-to-date images of wind energy contact Evan Vaughan, evaughan@awea.org. 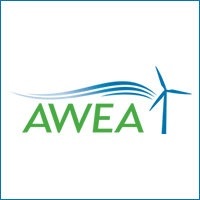 AWEA is the national trade association of the U.S. wind energy industry. We represent 1,000 member companies and over 100,000 jobs in the U.S. economy, serving as a powerful voice for how wind works for America. Members include global leaders in wind power and energy development, turbine manufacturing, and component and service suppliers. They gather each year at the Western Hemisphere’s largest wind power trade show, the AWEA WINDPOWER Conference & Exhibition, next in Chicago, Illinois, May 7-10, 2018. Find information about wind energy on the AWEA website. Gain insight into industry issues on AWEA’s blog, Into the Wind. And please join us on Facebook, and follow @AWEA on Twitter.